Update @12:30pm: I also recommend reading The New Trough by Naomi Klein on the Rolling Stone website. The more time passes, and the more that I learn about America’s crumbling financial system, the more I think maybe we should just let it all burn. You know, start over from scratch. Last month’s “rescue” plan – which I publicly supported given the dire circumstances – has done little to ease the credit markets because banks still aren’t lending to each other. Instead, the geniuses running these failing companies are using taxpayer money to merge with other troubled banks, give massive bonuses to executives who did nothing to deserve them, and fund hugely expensive executive “junkets” at exclusive resorts. The phrase “pissed off” doesn’t come close to describing how angry this makes me. 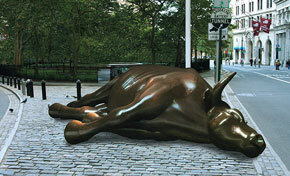 Via a Twitter post by Tim Bray, here’s your latest must read: The End of Wall Street’s Boom, by Michael Lewis. Michael, a Wall Street veteran of the excesses of the 1980’s, writes at length about a hedge fund manager named Steve Eisman – one of the few people who saw the anticipated the collapse of subprime mortgages and placed bets that their lenders would go bust. Eisman’s revelations are both infuriating and depressing. The people running and working at the lenders and ratings agencies were some combination of naive, stupid, and evil. They created financial derivatives so complex (and backed up by almost zero assets) that nobody completely understood how they worked or their potential for disaster. They didn’t know what they were doing, but were so blinded by greed that it didn’t matter. And now everyone has to pay for it. I believe a lot of people are to blame for our country’s current economic mess – gullible borrowers, greedy housing speculators, complaisant government officials. But none of these groups come anywhere close to Wall Street’s role. Fools or crooks, they are largely responsible.